Retention aids have long been used in graphic and packaging grades of paper and board. Their benefits in terms of production and raw material efficiencies are well known. However, the use of retention aids for tissue and towel production has been sporadic and not well accepted. Concerns over sheet properties, and a less dramatic case for raw material efficiency improvement have impeded acceptance. This paper discusses the benefits of controlled retention in tissue and towel grades including improved fiber efficiency, process and functional additive efficiencies, wet end stability, and felt performance and life. In the current environment of high raw material costs and demands for higher quality, these benefits can no longer be overlooked. 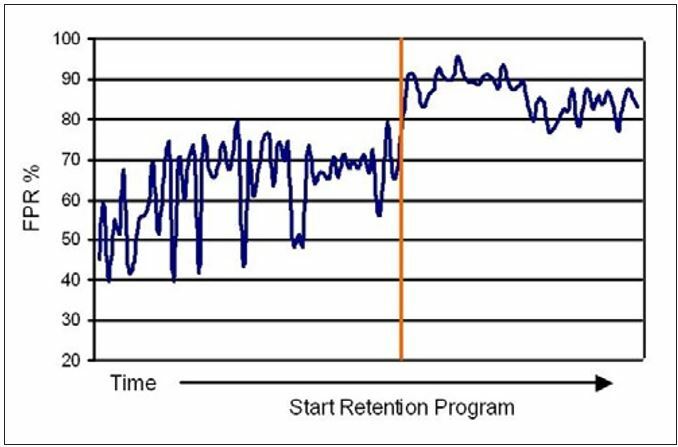 An interesting case study is included that demonstrates how a retention aid application enabled a producer to lower furnish costs by substituting a lower cost fiber, while maintaining sheet properties. Retention of fiber, fines and functional additives is sometimes referred to as the key to efficient papermaking. Much background information is available with regard to retention mechanisms and the types of programs in commercial use.1–4 Considerations for using a retention program on a tissue or towel machine will include the ability to deliver desired sheet properties, the efficient utilization of raw materials, as well as improved machine efficiency/productivity. We previously discussed in detail the mechanism accounting for potentially advantageous effects of retention aids (RA) on Yankee coating development and creping performance.1 In this article we will review survey results obtained from machines using RA’s, as well as two case studies showing improvements in wet-end process variability, and felt performance. An interesting new case study will also be presented on how RA’s can be used as a tool to optimize furnish costs. Table 1 summarizes data collected from retention aid programs run on 10 different tissue/towel machines. Although the table is just a subset of the total number of tissue machines that have used retention aids, the data is informative and appears directionally accurate. Included in the survey are different machine types, furnishes, and retention aid programs. The primary benefit associated with the increase in FPR was the potential to increase the fiber to paper ratio, or process yield. Additionally, the increased fiber retained with the sheet resulted in a lower solids load to the white water process clarifier (DAF) and a reduction in solid waste from this unit. Yield improvements varied between 1-5% depending upon whether the process utilized fiber recovery screens or recycled a portion of the DAF solids. • Five out of six machines that reported increases in FPR greater than 10 percentage points, saw an increase in coating thickness or adhesion. • The two machines that reported the highest increase in FPR saw the largest increase in coating thickness or adhesion. • Only one out of four machines that reported increases in FPR less than 10 percentage points saw an increase in coating thickness or adhesion. Table 1 – Survey results from 10 machines running retention aids. DAF Chemical Reduction. A typical machine water system sends a portion of the white water from the flume or silo to a supply tank where it is combined with various other process streams. This mixture is then pumped to a DAF or clarifier, which combines mechanical action and chemical treatment to separate the majority of the influent solids into what is commonly called “sludge.” The clarified water is returned to the process for reuse. The amount of chemicals needed to treat the DAF influent is primarily dependent upon the influent solids content. By increasing retention, the percent solids in the white water system is significantly reduced. This ultimately lowers the solids load to the DAF and the amount of chemical treatment needed for efficient unit operation. • Baseline DAF efficiency targets. While three of the seven applicable machines did not quantify a reduction in DAF chemical usage, they likely benefited from improved DAF efficiency or screen efficiencies that were simply not recorded before or during the data collection period. • Mill “D” and Mill “I” noted an increase in their felt life. This resulted from a reduction in high-pressure shower set points that ultimately reduced the wear rate of the fabric. 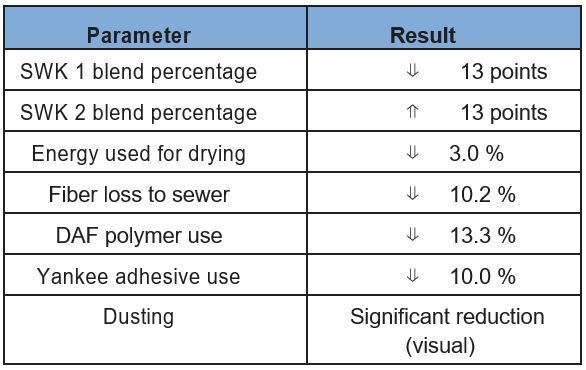 • Mill “J” saw a 75% reduction in the number of batch washes needed to treat the felt for both fines and wet strength contamination that resulted in increased production. • Mill “E” observed a reduction in high-pressure shower set points, although this has not translated into improved felt life. 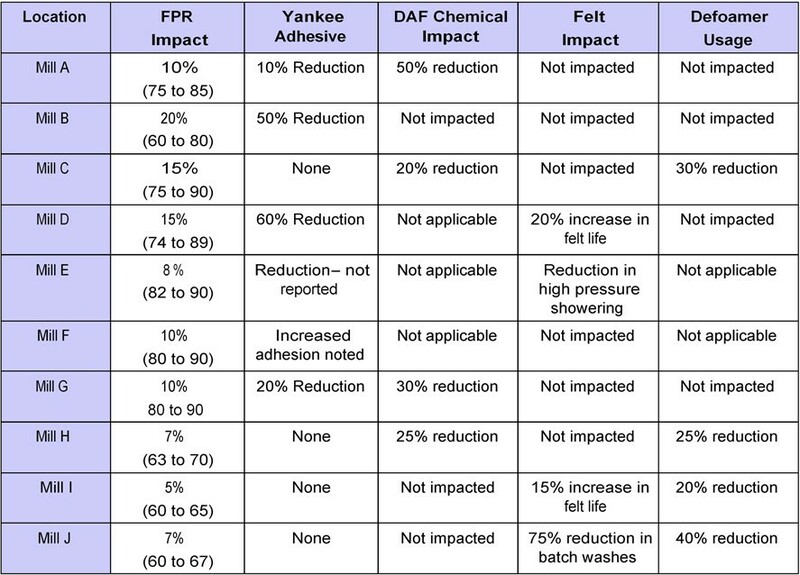 A more in depth discussion of the impact of retention aids on felt performance and the resulting benefits to Yankee coating is provided in the specific case study, “Improvement in Felt Performance,” below. • Defoamer control strategies varied from judging usage rates based on foam or entrained air to base loading a set amount at all times and not changing the set point without a compelling reason. It is possible that foaming was impacted during the trials, but defoamer addition rates were not adjusted to compensate for the change. • Addition strategies can impact the amount of unretained wet strength resin present that can lead to white water foaming. Three out of the four machines that reported a reduction in defoamer use were also using wet strength. • The use of anionic wet strength promotion chemistries varied in this study. The use of a wet strength promoter can reduce the amount of unretained wet strength and subsequent foaming tendencies of the white water. A decrease in defoamer use is important not just from a savings standpoint, but also because many defoamer formulations contain hydrophobic components that will contribute to release and hinder coating development on the Yankee. Therefore if defoamer addition rates vary, then an additional source of variation in creping performance can occur. The implementation of a retention aid program, coupled with customized control strategies, can reduce wet-end and subsequent Yankee coating variations. By targeting a FPR, or in this case, a white water turbidity, and controlling it through changes in retention aid addition rates, the stabilized wet-end will result in a more uniform creping operation. Mill K provides a specific example of improved wet end process stability. This mill experienced periodic loss of process reliability due to uncontrolled swings in retention and solids loading in the white water loop. Changes to the refiner or furnish blend often resulted in streaks developing in both the coating and on the fabric. Pick-outs and off-quality finished product were causing significant losses in production. Nalco and the customer worked together to implement a flocculant-based retention program along with a strategy to control white water turbidity to a target of 125 NTU’s. The turbidity was measured once per shift and the retention aid dose was adjusted to stay within statistically set control limits. Figure 1 illustrates how the implementation of this strategy both cleaned up the white water system and reduced the turbidity variation. The periodic machine upsets experienced previously were significantly reduced. 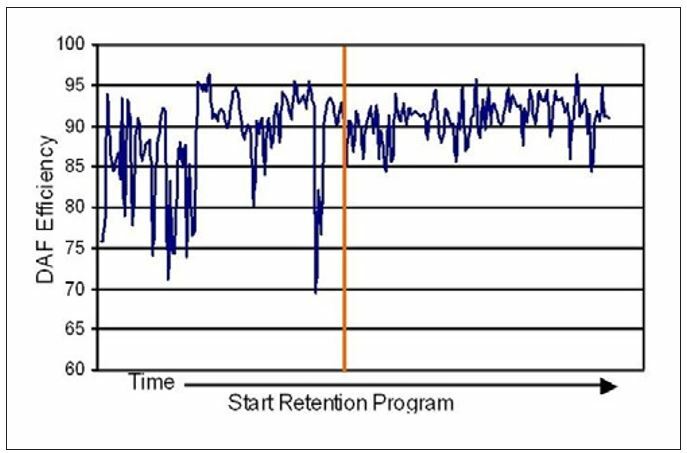 These appeared to be a function of the wet-end variation seen prior to implementation of the retention program. Figure 1 – Changes in white water turbidity upon application of a retention program at Mill K.
The decreased white water turbidity and lower variation corresponded to improved FPR and decreased variation in these values as well (see Figure 2). These results, therefore, support the approach of using whitewater turbidity as a means to monitor and control retention programs. The decreased variability of both FPR and whitewater turbidity were good indicators of a reduced MD variability in the amount of colloidal and fines material carried with the sheet to the Yankee. Since some of these materials are ultimately transferred to the Yankee surface, the reduced variability contributes to more stable and consistent coating and creping characteristics. With a consistent amount of natural coating contributing to film thickness and adhesion, a more stable creping operation ultimately results. Figure 2 – Changes in first pass retention (FPR) upon application of a retention program at Mill K.
• Clarified water quality impacts both wire and felt showering. Poor water quality due to DAF upsets is usually first noticed by fiber build-up on machine roll covers. The poor water quality will also reduce felt void volume and suction pressure roll (SPR) web solids thus impacting the coating development at the SPR / Yankee interface. • Clarified water is often used for consistency control or pulper dilution, which impacts the entire process. An increase in fines in the clarified water will reduce chemical efficiencies throughout the process and likely reduce FPR. In Mill K the increased FPR, along with lower variation, resulted in a consistently reduced solids load to the DAF unit. A significant improvement in DAF efficiency with reduced variation in the clarified water quality was observed (see Figure 3). Figure 3 – Changes in DAF efficiency upon application of a retention program at Mill K.
• Continuous cleaning to assist in mechanical removal of contaminants. The mechanical strategies, while effective, can lead to premature felt wear and excessive water carryover that reduces drying capacity. Chemical cleaning adds cost and batch cleanings on the down result in lost production. In an effort to identify the root cause of felt contamination, Nalco Europe B. V. (Leiden, The Netherlands) accumulated data associated with felt analyses from tissue machines.5 The analysis of 40 felts showed the major source of contamination was due to nonextractable solids. Furthermore, fiber fines were the largest contributor to the non-extractable fraction of the contaminants. Fixing the fines to the sheet by utilizing a retention program, instead of having them migrate into the felt, appears to be a logical way to keep the felt clean. Table 2 illustrates the results from this effort and confirms substantial benefits accrued due to the use of a retention aid. The significant reduction in white water turbidity verified the selected coagulant chemistry was active in the system. Although the FPR only improved about 5 percentage points, the white water turbidity was reduced by 75%, indicating good fine particle retention. During the trial period, the suction pressure roll vacuum remained lower than historical trend lines, indicating the felt was not filling as fast. This reduced batch on-the-down cleanings, a practice machine personnel traditionally utilized to keep the felt open. Additionally, reductions in high-pressure shower set points reduced felt wear, and increased felt life. Table 2 – Mill L Felt Performance Data Summary. 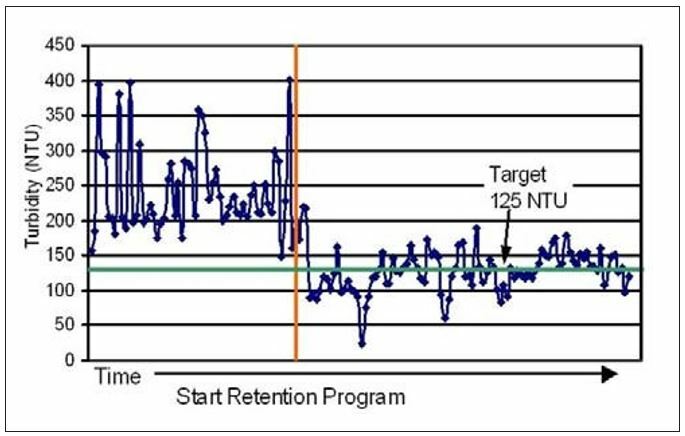 Direct confirmation that the retention approach had worked was found from the felt analysis completed after the trial period was over. Total non-extractables were reduced by 25% as compared to baseline averages. This improvement seemed to be driven by the retention program’s ability to keep the fines with the sheet as percent fines filling was reduced by 60%. Furthermore, the felt life improvement was sustainable through additional felt cycles as shown in Figure 4. Overall, the reduction in batch washes combined with the improved felt life has led to a 1% improvement in annual production. 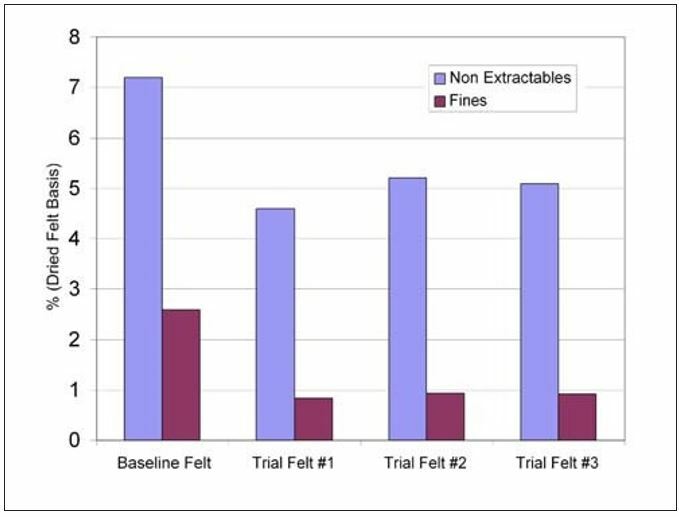 Figure 4 – Mill L felt analysis results for non-extractables and fines contaminants. Optimal dewatering and lamination of the fibrous web in the Yankee-SPR nip is directly related to sheet adhesion at the creping doctor blade and, thus, the creping transformation. Since the felt is a functional element in the nip, variability of felt performance must be decreased in order to reduce variation of the creping transformation. Moisture variation exiting the nip will be directly related to felt permeability, that is, the more resistance to flow in the felt, the higher the moisture in the sheet exiting the nip. Archer et al.6 previously described the importance of the felt in nip dewatering dynamics. Excess water in the nip will dissolve, or overly soften, the coating leading to streaks and non-uniform creping. The beneficial effect of using a retention aid to reduce variation and extend the operational life of the felt is an effective tool for tissue makers to consider. A major component of raw material costs in the manufacture of tissue and towel is, of course, the fiber. Tissue makers are continuously considering the cost/performance tradeoffs involved in substituting lower cost fiber sources for more expensive ones. The effect of fiber substitution on final sheet properties is probably the most important limiting factor, since tradeoffs with strength, softness, bulk, stretch, and absorbency can occur. In this case study the substitution of one lower cost virgin kraft fiber for another is described, and therefore the discussion will be limited to fiber properties relevant to this fiber type. Important fiber properties to consider are fiber length, fiber width and coarseness, fiber curl, fiber kinks, and the fines content of the furnish. As is well known, fiber length plays an important role in sheet strength. Page summarized the direct relationship between fiber length and tensile strength (breaking length) in presenting his theory for the tensile strength of paper.7 Paavilainen8 showed a linear relationship between fiber length and tensile index over the fiber length range of 1-2.5 mm for softwood kraft pulp. Fiber coarseness is typically defined as the mass of fiber divided by the total fiber length, and is determined by the fiber wall thickness, width, and density. Summerwood fibers are coarser than springwood fibers due to their greater wall thickness. Thus springwood fibers will provide greater sheet tensile strength due to their thin fiber walls, which provide greater fiber flexibility and result in a greater effective bonded area. Secondly, the greater number of fibers per unit volume or mass that are present in low coarseness pulps provide more load bearing fibers in the network.9 For softwoods, fibers having a greater length/diameter ratio are preferred for handfeel, and therefore coarse fibers typically are less desirable. A good example can be given by the comparison of southern (US) pine pulps to northern (Canadian) spruce pulps. The southern pine fiber source is disadvantaged both from the standpoint of thicker cell walls, as well as, a significantly higher percentage of summerwood. The effect of fines on sheet strength properties is important, but overlooked in many instances. The secondary fines generated by fiber refining can be very effective at improving strength measures such as tensile.8,12,13 Springer and Pires14,15 specifically studied the effects of fines on tissue properties including strength, absorbency, and formation. They found that the strength (as measured by burst index) of laboratory handsheets increased with increasing fines content. 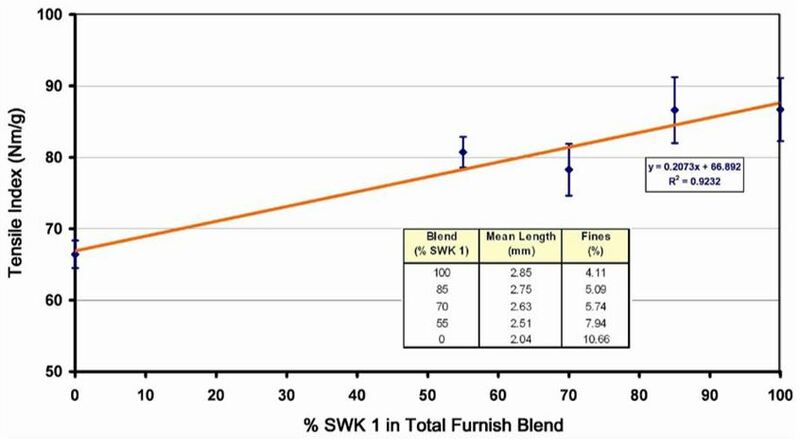 In the current case study, the customer was using two virgin softwood kraft furnishes (see Table 3), typically in a blend ratio of approximately 85% SWK 1 and 15% SWK 2. The price of SWK 1 was approximately $150/ton greater than SWK 2. Therefore, the customer had an obvious desire to increase the amount of SWK 2 in the furnish blend. However, previous customer attempts to increase SWK 2 significantly beyond 15% resulted in a number of problems attributed to the higher fines content and shorter fiber length of SWK 2. These included poorer drainage and drying on the machine and an inability to meet strength targets for this towel grade. Table 3 – Fiber Quality Analyzer characterization of SWK pulps 1 and 2. Note that SWK 1 was refined to a freeness of 546 ml CSF and SWK 2 to a freeness of 363 ml CSF. Nalco proposed a retention aid trial for the purpose of increasing fines retention and alleviating the drainage and drying issues. It was believed that the inclusion of more fines in the sheet would help to improve the strength of the produced towel. The retention aid (RA) program that was trialed consisted of a cationic flocculant fed prescreen and an anionic microparticle fed post-screen. Dosage levels were 0.8 lb/T flocculant and 0.3 lb/T microparticle. 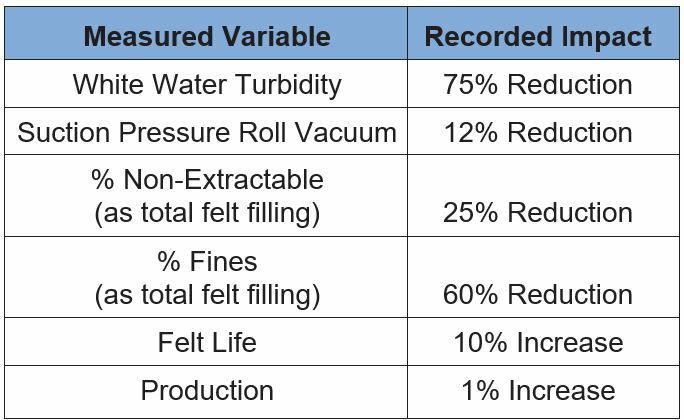 Analysis of data from the mill’s process control system before and during the trial showed the following results, which are also summarized in Table 4. The use of SWK 2 was increased from 17% to 30%, with an accompanying reduction in SWK 1 from 83% to 70%. Wet and dry strength values remained within normal target ranges. The amount of natural gas used for drying the sheet decreased by 3%. In agreement with the survey results provided earlier, the amount of fiber lost to the sewer decreased by 10.2%. This was accompanied by a decrease in process sewer turbidity of 9.3% and a decrease in DAF polymer usage by 13.3%. Also in agreement with the survey results, the Yankee adhesive usage decreased by 10%. Another important observation was that dusting was significantly reduced during the trial. Table 4 – Summary of trial results comparing a 3-month time period prior to retention aid (RA) addition to the 5-week trial period when RA was added. Additional lab work was performed to better understand the commercial results that were obtained with the RA program. A characterization of the two SWK pulps was conducted using the Fiber Quality Analyzer (FQA) from OpTest Equipment, Inc. (Hawkesbury, Ontario, Canada). The results from this characterization are presented in Table 3. The major differences between the fiber types are in the length and fines content. As expected, SWK 2 had a shorter fiber length by about 28% and over 2.5 times the fines content of SWK 1. There was also a significant difference in curl index, however, SWK 1 had the higher curl index, so based on machine experience with sheet strength of the two pulps, in this case, the effect of curl appears to be a minor factor compared to fiber length. Handsheets were made from various furnish blends of the two pulps, lightly pressed, and dried using an electrically heated drum dryer. The average sheet basis weight was 53 g/m2. Measuring the dry tensile index of these sheets provided the tensile strength to fiber composition relationship shown in Figure 5. As expected, the tensile index decreased with increasing content of SWK 2 in the furnish blend. The points are fitted reasonably well by a straight line, however some of the variability may be reflective of the competing factors of fiber length, fines contents, and formation on sheet tensile values. The fiber length and fines contents for each furnish blend, as determined by the FQA, are also included in this Figure. The changes in length and fines content were essentially linear with the blend ratio. Figure 5 – Tensile strength relationship for blends of SWK 1 and 2 (no RA added). Data obtained from laboratory handsheets made using a Noble and Wood handsheet mold and having an average basis weight of 53 g/m2. For the 70/30 SWK 1/SWK 2 fiber blend, the retention aid program utilized during the mill trial was added to the laboratory stock (RA mixed with stock using a Britt jar) prior to sheet formation. A detailed statistical comparison of the sheet tensile results, for the 70/30 furnish blends, with and without retention aid, and compared to the 85/15 furnish blend without retention aid, is provided in Figure 6. A statistical difference (95% confidence interval) was observed between the two furnish blends without retention aid added, with the 70/30 blend having the lower tensile index value. Inclusion of the RA increased the tensile index by about 3 Nm/g, which was enough to erase the statistical difference between the 70/30 RA treated pulp and the 85/15 untreated pulp blend. The mechanism of strength improvement is believed to be due to fines, as well as soluble and colloidal materials retained in the sheet. A similar positive influence on strength, due to fines retention, is believed to be the reason for the observed commercial trial results, where the SWK 2 pulp could now be used at a higher level than previously attainable. Figure 6 – One-way analysis of dry tensile index results by furnish condition using JMP statistical software (SAS Institute, Inc.) 10 tests were made for each condition. 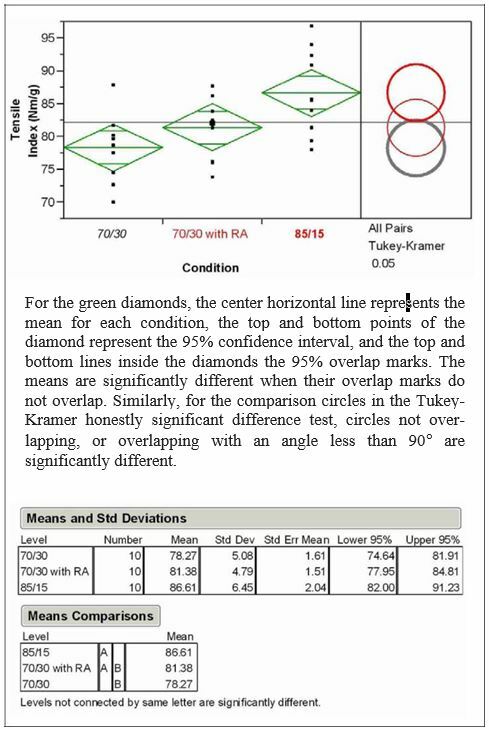 The means comparison by Tukey-Kramer HSD test is shown graphically and in table format. Data collected from a wide variety of tissue/towel machines showed the versatile nature of retention aids in the manufacturing process. Benefits included fiber and additive efficiencies, reduction of wet-end process variability, improved felt performance, increased Yankee coating, and furnish cost optimization. Fiber fines retention should not be overlooked as a means to increase strength and to better utilize lower cost furnish sources. With regard to coating, increases in thickness and adhesion roughly correlated to the magnitude of FPR improvement upon implementation of a retention program. The improvement in coating thickness can be explained by increased levels of natural coating components contributing to the coating. Even small improvements in FPR can lead to large improvements in fine particle retention. The improved small particle retention can result in improved felt cleanliness, DAF efficiency, reduced defoamer use, and improved process reliability. All of these improvements help coating development and ultimately lead to better creping. 1. Furman, G., Phillips, R., and Archer, A., “Wet End Impacts on Creping Part I – The Effect of Retention Aids on Yankee Coating,” Tissue World 2007, Nice, France, March 2007. 2. Scott, W. E., “Fines Management and Control in Wet-End Chemistry,” Tappi J. 69, no. 11, 30-34 (1986). 3. Eklund, D. and Lindstrom, T., Chapter 7, “Retention and Dewatering,” in Paper Chemistry, An Introduction. Grankulla, Finland: DT Paper Science Publications, pp. 145-191 (1991). 4. Kim, Y. H. Coagulants and Flocculants, Theory and Practice. Littleton, CO: Tall Oaks Publishing, Inc., 1995. 5. da Silva Santos, C., “Optimizing Pick-up Felt Conditioning on the Run Improves Tissue Machine Efficiency,” Tissue World (October-November, 2003). 6. Archer, S., Furman, G. S. and Daily, W., “Creping Optimization, Look One Step Back,” Tissue World Americas Conference, Miami, FL (March 2006). 7. Page, D. H., “A Theory for the Tensile Strength of Paper,” Tappi J. 52, no. 4, 674-681 (1969). 8. Paavilainen, L., “Importance of particle size – fibre length and fines – for the characterization of softwood kraft pulp,” Paperi ja Puu, 725, 516-526 (1990). 9. Paavilainen, L., “Importance of cross-dimensional fibre properties and coarseness for the characterization of softwood sulphate pulp,” Paperi ja Puu, 755, 343-351 (1993). 10. Page, D. H., Seth, R. S., Jordan, B. D., and Barbe, M. C., “Curl, Crimps, Kinks and Microcompression in Pulp Fibres – Their Origin, Measurement and Significance,” in Papermaking Raw Materials, Transaction of the Eighth Fundamental Research Symposium, Oxford, Vol. 1, pp. 183-227, Sept. 1985. 11. Kibblewhite, R. P. and Kerr, A. J., “Gaseous ammonia treatment of pulp, the effect on fiber kinking and paper properties,” Tappi J. 62, no. 10, 119-123 (1979). 12. Retulainen, E., Moss, P., and Nieminen, K., “Effect of fines on the properties of fibre networks,” in Products of Papermaking, Transactions of the Tenth Fundamental Research Symposium, Oxford, Vol. 2, pp. 727-769, Sept. 1993. 13. Retulainen, E. and Nieminen, K., “Fibre properties as control variables in papermaking? Part 2. Strengthening interfibre bonds and reducing grammage,” Paperi ja Puu, 785, 305-312 (1996). 14. Springer, A. M. and Pires, E. C., “The effect of fibrous fines on tissue properties,” Tappi J. 71, no. 2, 99-102 (1988). 15. Springer, A. M. and Pires, E. C., “Combined effect of fiber fines and dissolved organics on tissue properties,” Tappi J. 71, no. 4, 141-144 (1988).